I am sitting at work. We are in the middle of a heat wave, and I would rather be stuck in a cold store refrigerator than in my office. I had no plans of being anywhere else today as I was expecting 2 pallets of goods to be delivered to me. But just like in December, my supplier has let me down. He has so not come to the party. In December he promised me my goods had left on the Wednesday. So with a Friday delivery expected I planned the last 3 days of our working year. Sadly for me, the goods arrived on the Monday afternoon leaving me half a day to do 2 and a half day’s work. And of course they were closed so I could not not even tell him how upset I was. Thinking they were opening earlier than they did, I planned my start to the year. However, they were still closed when I placed a large order with them to kick start January. The least I expected was that my order would be given some priority and leave on time. It didn’t and now I am sitting at my desk, whiling away the time until lunch so that I can eat, and leave. One thing that can go to any party is this amazing French butter cream. 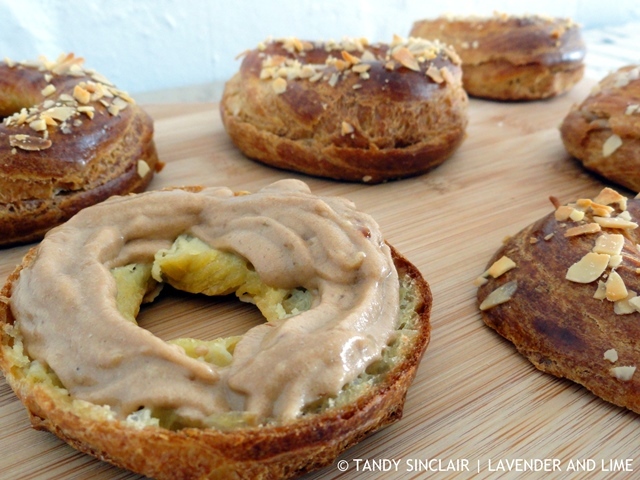 You may recall I mixed it with praline and used it to fill my Paris Brest choux buns. I have some left in the freezer and the next time I have a cake to take somewhere I will use the rest of the butter cream up to sandwich the two halves together. Sorry to hear about the people that have let you down Tandy! This buttercream sounds deliciously versatile! It’s freezin over here and I wish I could have one of those choux pastry buns with your French pastry cream! Mmmm – delicious – Tandy. I am ready to try this delicious butter cream, it looks so smooth! I do not feel bad for your heat wave right now! Come visit us in Boston 🙂 Having a little French butter cream with my breakfast would certainly make things a little bit better! I love the idea of using this buttercream to fill cakes. I’m in the process of making my daughters birthday cake to celebrate her 3rd Birthday and I was struggling with what to use in between all those layers of cake. Thanks for sharing. Heat wave!! In some ways, I think you are lucky. The high this weekend is 1 degree! One degree. So unbearably cold. So frigid here that it literally takes your breath away. Oh no! That is so annoying and such a bummer about the delivery. But your French butter cream looks glorious!